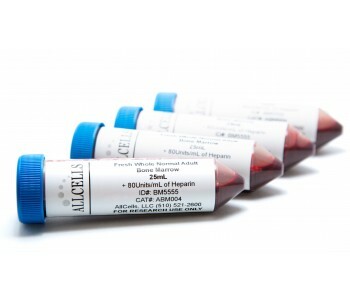 Bone Marrow products are collected by qualified clinicians from the posterior iliac crest of a healthy donor. Aspirate (50mL) is drawn from each hip from a maximum of 2 sites using multiple syringes. The aspirate is filtered to remove clots, bone chips, spicules, and then pooled to normalize cell concentration between draws. Isolated or Cultured Cells: MNC, MSC, and positively selected (NS) cells. *Cell type, cell selection method, and unit size (by volume or cell count) vary depending on format. Unfortunately the selected product cannot be ordered online. Please contact our Customer Care for assistance. No customization is available for the configured product at this time.